CEU Info: The Centre for Expressive Therapy is accredited both by the Association for Play Therapy, Provider number (#95-010) and the Canadian Association for Child and Play Therapy, Provider number (#09-102) to offer continuing education specific to play therapy. 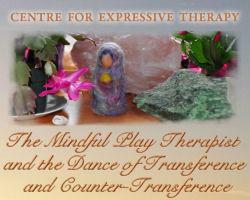 "The Mindful Play Therapist and the Dance of Transference and Counter-Transference" is offered as Level 1 and Level 2. Each level is a 3-day seminar intended for experienced therapists who use expressive play therapy with children and/or adults. Our main focus will be on the play therapist's self-knowledge and continuous self-development and his/her growing ability to provide children and adults with a safe place to connect to their innate resources and eventually better meet whatever challenge brought them to therapy. The goal of these seminars is to provide participants with the opportunity to use expressive therapy methods to develop greater self-awareness and gain practical tools for personal/professional growth.